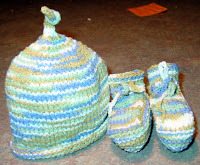 I have completed another set of baby hat and booties. This set is for my boss's new son Nathan. I also made a bib from Mason-Dixon Knitting. I used Cascade Fixation for the hat/booties.... 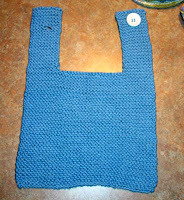 I used Rowan handknit cotton for the bib. I have some pink to make a bib as well, however next time I think I'll make the bib in reverse so I can just keep knitting until the yarn runs out. That would mean making two straps, then joining them with cast on stitches in between and knitting. I never know what to do with all those odds and ends of the different types of yarns! When you were little - did you play Duck, Duck, Grey Duck? I've been told that Duck, Duck, Grey Duck is purely a Minnesota thing. Evidentally the rest of the world says Duck, Duck, GOOSE! So, what did YOU say? What does my favorite goalie do after saving 82 of 84 shots on goal at the District Hockey tournament? I was asked by a friend at work (in November) to knit 2 sets of hats and baby booties for her first 2 grandchildren - to be born in February. I'm just doing it! ARGH. Here is the first set. The booties for set number 2 are complete as is almost 1 inch of the hat - knit, knit, knit, knit! As usual, the pattern is Anna's Baby Booties from the Tangled Skein - the hat is Theresa Gaffey Designs (#68) Basic DK-weight Baby Hat. Yarn is Cascade Fixations. 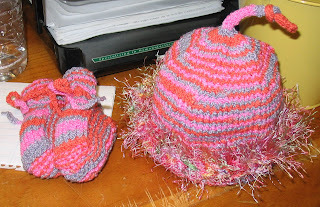 I made the newborn sizes in both and have lots of scraps left to add to a scrappy hat. It is made with Katia Tundra color 6705 that is 50% wool, 40% acrylic and 10% viscose. I did 64 stitches and did 1 x 1 rib to keep it nice and tight against their little necks. I'm really liking this yarn, I'll need to get some more!